There are many areas of your HE washer that are prone to mold growth. If you are experiencing an odor coming from your HE washing machine, it may be time for a thorough cleaning. We will show you the most likely areas on your high efficiency washer that are prone to mold and mildew. We will also give you some tips to clean your washer and prevent that bad smell from returning. Why Does My Washer Have An Odor? You may be using the wrong type of detergent. The wrong detergent will over sud (to many soap bubbles) and add moisture in hidden areas causing mold or mildew that you may not be able to see. You need to use an HE detergent with any HE washer. You may be using too much detergent. Too much detergent will cause excess soap bubbles. This may add extra moisture in certain areas that will promote mold growth. Your washer is located in a humid area. If your washer is located in a garage or anywhere that may be hot and humid with no air conditioning in the room, mold will grow. This means that the areas inside the washer that get wet will not fully dry. If your washer is located in a humid or “wet” area, it is best to add a small fan near it to circulate air and promote evaporation. Wash temperature water is too low. If you wash your clothes in “cold water” mode, this may promote mold growth as no hot water is running through the machine to dissolve and drain away mold. You leave the door and detergent dispenser closed. After each wash, it is best to leave the door and soap dispenser open for a couple hours to let them air dry. If the door and dispenser is closed when still wet, mold or mildew can grow. Your detergent tray has never been cleaned. Periodically you need to remove the complete detergent tray and soak it in your sink with hot water. The dispenser comes out by opening it, then pressing a button toward the back and gently pulling. There may be a slight leak under or behind your washer. A small leak may not be noticed. This can cause mold or mildew growth under, behind, and on the bottom of your washer. Pull machine out from the wall and check for water on the floor. The door seal has never been cleaned. 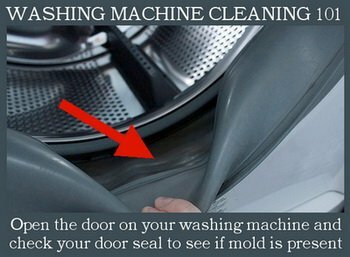 Make sure you clean the door seal especially paying attention to the bottom area. Pull the seal slightly back and wipe up any water or moisture that is present. The filter has never been cleaned out. Your washer should have a filter located on it to catch gunk before it enters the pump. See your owners manual or Google your washer and model number to find location and how to access it. The new HE machines are not like the traditional agitator washers. Most HE washers use a “tumbling” system. On HE washers, there is no “back and forth” agitator. 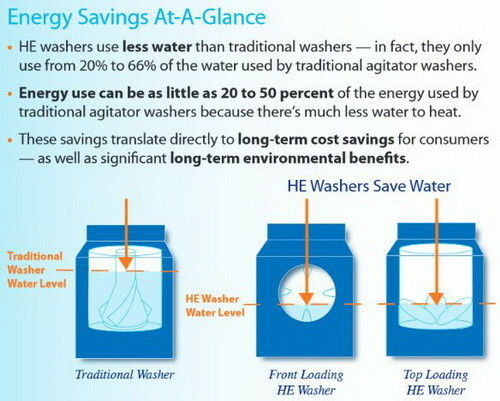 Since these HE wash systems are designed to be so efficient they use way less water to do the same job. With less water, HE washers can wash larger loads than most traditional washers. How To Clean An HE Washer? Method 1 – Your washer should have a “clean” mode. Run the washer on clean mode with the hottest possible water setting. Add vinegar if desired. Method 2 – You can clean out the inner workings of the washer. Add one cup of bleach to your washer and run on the longest possible cycle and with hot water. Method 3 – If mold or mildew is present on the door seal or elsewhere, use a toothbrush and bleach mixture to scrub it away. You can also use vinegar, borax, lemon juice, or baking soda depending on your preference. Method 4 – Wipe out the inner tub, door seal, and detergent dispenser. Use a bleach mixture and wipe down basically everywhere you can see. Inspect for obvious signs of mold or mildew and concentrate on those areas. Method 5 – Use a specialty cleaner such as affresh. This cleaner has different ingredients that is perfect for cleaning HE front load washers. If you have other suggestions on how to clean an HE washer, please let us know by leaving a comment below. 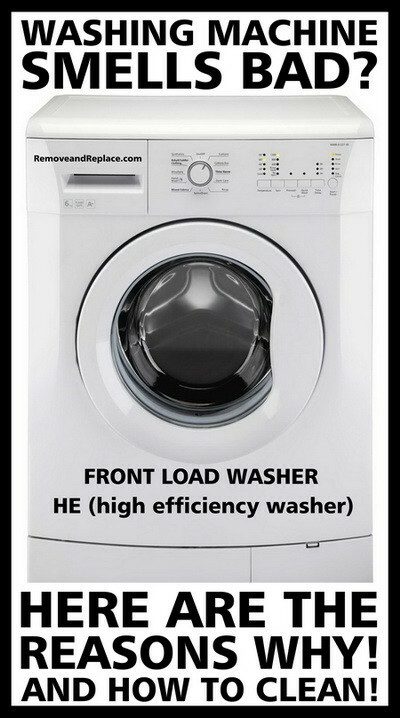 consider your next washer to be an HE to maximize efficiency. I haven’t noticed any kind of strange smell coming from my washer, but it’s good to know that some high efficiency washers are prone to mold growth. That’s something that I’ll have pay close attention to in the future. Hopefully I won’t need to do any kind of thorough cleaning to remove mold or mildew from it while I’ve got it.